CLARK COUNTY — The National Weather Service has issued a flood watch for parts of Clark County from this afternoon, Wed., Feb. 8, through late Fri., Feb. 10. The affected parts of Clark County included in the flood alert include: Amboy, Battle Ground, Ridgefield, Vancouver, Washougal and Yacolt. A flood watch, according to the NWS, means there is potential for flooding based on the most current weather forecasts. People living in flood-prone areas should check the NWS site to make sure the flood watch has not been upgraded to a flood warning. The NWS also cautions that landslides and debris flows are possible, especially in areas below steep slopes, in canyons and near the mouths of canyons, over the next two days. The city of Washougal urges residents to “do their part” to help with storm preparations by clearing sidewalks and pathways and keeping debris from blocking storm drains. The city also released a list of sandbag pick-up locations throughout Washougal for residents who wish to better secure their homes from the risk of flooding. The three Washougal sandbag pick-up spots include: the 2300 block of North L Street, Silver Star Search and Rescue at the corner of 13th and A streets and the Public Works Operations building at 2201 C St. The Camas-Washougal Fire Department reports that volunteers are currently active and available to be dispatched where needed if flooding occurs. In a flooding related event, residents can call the fire department volunteers at (360) 834-2262. 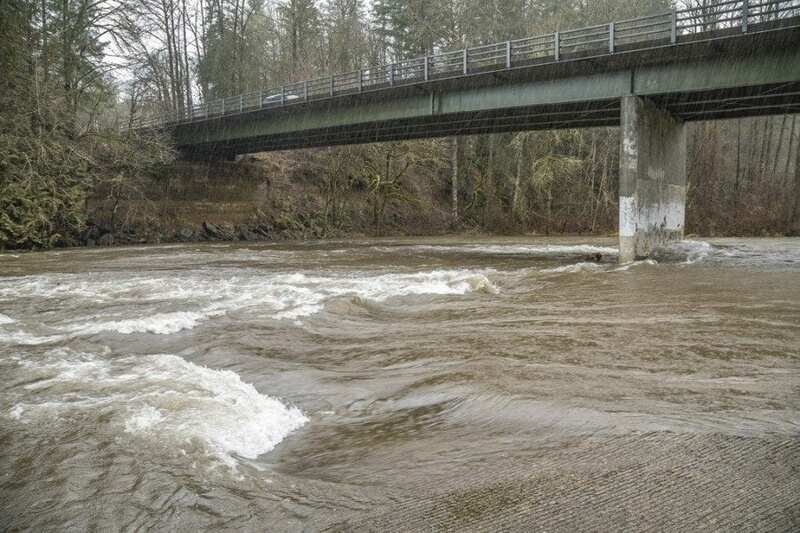 As of 11:15 a.m. on Wed., Feb. 8, the Washougal River was observed at 6.73 feet. Flood stage for the Washougal is 14 feet. The last time the Washougal River crested its banks was on Nov. 18, 2015, when it hit a historic level of 15.33 feet. To gauge the river’s level and check to see if it is nearing flood level, click this link and make sure the “Auto Refresh” button is activated.